President Donald Trump speaks to the United Nations General Assembly, Tuesday, Sept. 19, 2017, in New York. UNITED NATIONS (AP) — President Donald Trump, in a combative debut speech to the U.N. General Assembly, threatened the "total destruction'" of North Korea if it does not abandon its drive toward nuclear weapons. Trump, who has ramped up his rhetoric throughout the escalating crisis with North Korea, told the murmuring crowd at the U.N. on Tuesday that "it is far past time for the nations of the world to confront" Kim Jong Un and said that Kim's "reckless pursuit of nuclear weapons" poses a threat to "the entire world with an unthinkable loss of human life. "Rocket man is on a suicide mission for himself and his regime," Trump said about the North Korean leader. He said of the U.S.: "If it is forced to defend itself or its allies, we will have no choice but to totally destroy North Korea." Elected on the nationalist slogan "America First," Trump argued that individual nations should act in their own self-interest, yet rally together when faced with a common threat. 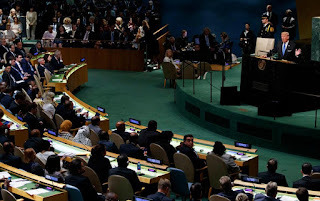 Using bellicose language rare for an U.S. president at the rostrum of the United Nations, Trump touched upon hot spots around the globe, declaring "The scourge of our planet is a group of rogue regimes." He urged nations to join together to stop Iran's nuclear program — he declared the deal to restrain it an "embarrassment" for the United States — and defeat "loser terrorists" who have struck violence across the globe. He denounced "radical Islamic terrorism," the inflammatory label he has recently shied away from. He warned that some violence-plagued portions of the world "are going to hell." And he made little mention of Russia. North Korea drew most of Trump's attention and anger. Trump, who has previously warned of "fire and fury" if Pyongyang does not back down, claimed that "no one has shown more contempt for other nations and for the well-being of their own people than the depraved regime in North Korea." And he scolded nations that it was "an outrage" to enabled and traded with North Korea, seeming to slight China, though he did not mention it by name. Addressing the General Assembly is a milestone moment for any president, but one particularly significant for Trump, a relative newcomer to foreign policy who has at times rattled the international community with his unpredictability. He has pulled the Unites States out of multinational agreements, considered shrinking the U.S. military footprint in the world and deployed bombastic language on North Korea that has been criticized by other world leaders. Trump frequently belittled the U.N. as a candidate and some within his White House believe the U.N acts as a global bureaucracy that infringes on the sovereignty of individual countries. He urged the world leaders to embrace their own "national sovereignty to do more to ensure the prosperity and security of their own countries. But the president stood before world leaders and a global audience and declared that U.N. members, acting as a collection of self-interested nations, should unite to confront global dangers. "I will always put American first. Just like you, the leaders of your countries, should and always put your countries first," said Trump, who assured the U.N. that the United States would not abdicate its leadership position in the world but needed other countries to contribute more. "The U.S. will forever be a great friend to the world and especially to its allies," the Republican president said. "But we can no longer be taken advantage of or enter into a one-sided deal in which the United States gets nothing in return." World leaders, many of whom will be seeing Trump in person for the first time, were certain to take the measure of the man and parse his every word for clues on how he views the U.S. role in the world and within the U.N. Trump's remarks produced surprised chatter in the crowd and the North Korean delegation, assigned by a lottery to a seat near the front, departed as the president began speaking. Trump also called the U.N.-backed Iran nuclear deal "an embarrassment" to the United States and suggested it was "one of the worst" international pacts ever struck. And he hinted that his administration, which has accused Tehran of aiding terrorism in the Middle East, could soon declare Iran out of compliance with the deal, which could unravel it. "I don't think you've heard the end of it," Trump said. "Believe me." He vowed again to take the fight to terrorists but warned that parts of the region were so plagued by violence and poverty, they were "going to hell." He also decried the "disastrous rule" of Venezuela's Nicolas Maduro and urged the U.N. to step in. "It is completely unacceptable and we cannot stand by and watch," Trump said. "To put it simply, we meet at a time of both immense promise and of great peril," he said. "It is entirely up to us whether we lift the world to new heights or let it fall into a valley of disrepair." Outside of an oblique reference to a threat to Ukraine's sovereignty, Trump made no mention of Russia or its president Vladimir Putin. He again chastised the U.N. for what he said was its bloated budget and bureaucracy but did not threaten Washington's commitment to the world body. He pledged the United States would be "partners in your work" to make the organization a more effective force for world peace. While running for office, Trump had labeled the U.N. weak and incompetent. He has suggested it was "not a friend" to the United States or democracy while deriding it as "a club for people to get together, talk and have a good time." He spoke often during the presidential campaign about putting "America first," and has withdrawn from some multilateral agreements that he found unfavorable to the United States, such as the Trans-Pacific Partnership trade deal. He also announced his intention to withdraw from the Paris climate accord, which would leave the U.S. one of the few countries outside the pact. Aides have since suggested Trump would be willing to renegotiate terms of the deal but European leaders have dismissed that approach. The administration has shied away from talk of nation-building or creating democracies through the use of the U.S. military. "We do not expect diverse countries to share the same cultures, traditions or same systems of government," Trump said at the U.N. He added that he does expect all nations to "respect the interest of their own people and the rights of every other sovereign nation."